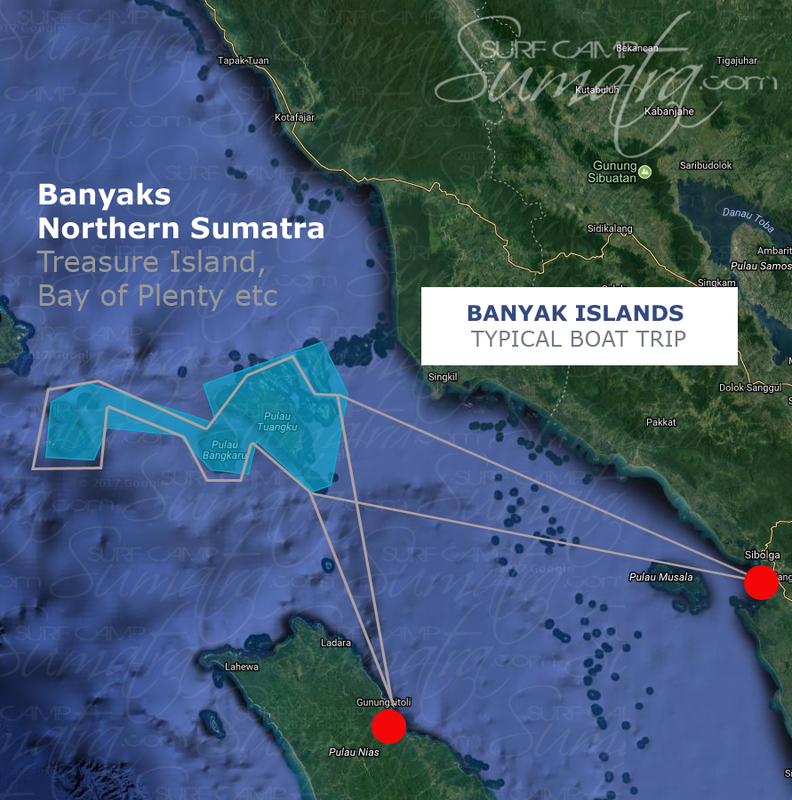 "The Banyak's are made up of 99 sparsely inhabited islands & sit off the coast of North West Sumatra. They are home to world class waves including "Treasure Island" as well as a wave dense cluster of breaks, found in the "Bay of Plenty." Banyak Surf Charters usually start & end Sibolga. Typical Banyak Islands surf trips are 11 days in length, with set dates (as standard) but in the "off season", dates can be flexible. Charter boat capacity ranges from 8 guests up to 14 guests. Ideally suited for large groups to book out the whole boat, there are also options for any size group - as well as single guests. Each trip will visit much of this wave rich region. Medium to large south swells should give the chance to surf the world class Treasure Island. Swells with west will light up the Bay of Plenty which is home to half a dozen excellent waves. There are a handful of tightly guarded secret spots too. The surf guide will always discuss the options with the group prior to departure (from Sibolga) so the group can make a call on where they'd prefer to surf. Below you will find all the options we recommend. Please feel free to ask any questions you might have! The Nomad surf charter is skippered by an Australian and is perfect for small groups of 6-8 guests. An 85' teak and iron wood phinisi surf charter, the Ismari can comfortably sleep 8 guests within its 5 a/c cabins. The Jiwa is a 75' traditional phinisi surf charter boat that can comfortably sleep 8-10 guests. The Santana Laut boasts gourmet level food, first class Aussie skippers, 8 (a/c) cabins as well as 2 indoor social areas.